Great Divide has been slowly changing its line-up of year round beers over the last few year and one particular beer gathered a lot of attention early on when awards time came around. 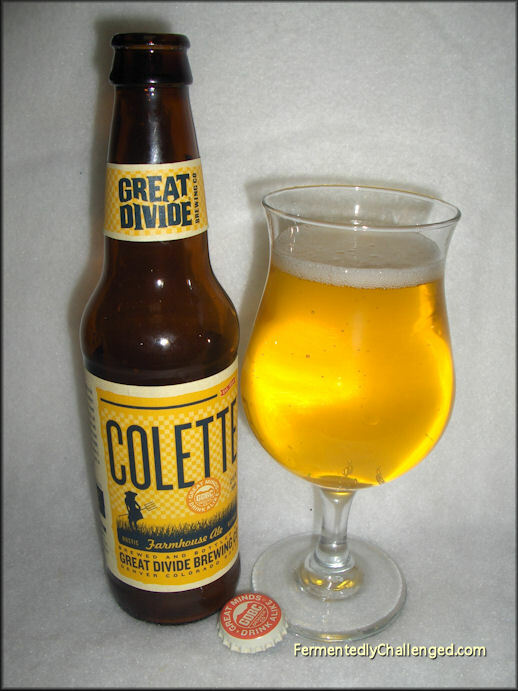 Great Divide Colette Farmhouse Ale came on-board a few years ago and quickly won a couple silver and bronze medals in 2010 and 2011. 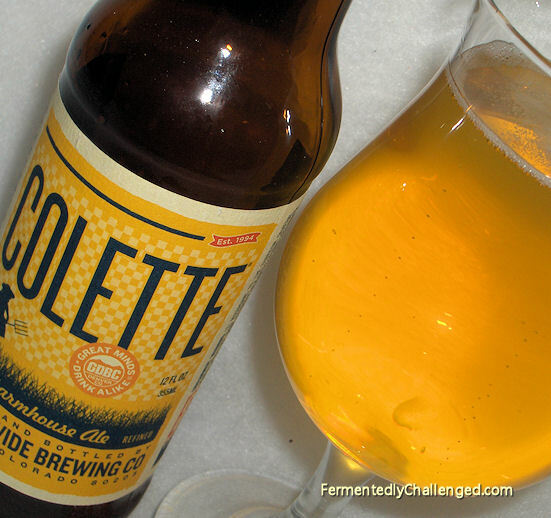 Colette is a Farmhouse Ale, fashioned after the beers that Belgian farm workers used to drink. Great Divide put in 4 different funky Belgian yeasts and came up with a blend of barley, wheat, and rice and lightly bittered this beer. Colette weighs in at 7.3%, so it's no light weight despite the lighter color. For you calorie counters, Colette has around 219 calories per 12oz bottle. With so many saisons coming into the market these days, how would Great Divide's farmhouse ale hold up to the rest? Appearance: Great Divide's Colette poured a pale yellow and nearly seemed to glow bright yellow in the light. There was a very small bright white head on this beer, and what head there was disappeared very quickly. The beer appeared with no sediment, yet had a noticeable haze to it. There seemed to be just a bit of a yeast cloud at the bottom of the bottle, but that's common for a beer such as this. Aroma: Bring on the funk! Colette had a wonderful Belgian yeast aroma that had plenty of sweet tropical fruits, grasses, bread and a hint of bubblegum. While many saisons seem to have very similar yeast aromas, this one has a bit more of the malts and wheat tones come through on the nose. Taste: The first few sips reminded me of a tart wheat brew. There was a slight sweet fruit and honey component mixed in with a bitterness and light malty taste. There was the funk from the yeast, but it wasn't overly done. The beer drank easy and left a dry finish at the end. I could pick up a sense of banana later on in the session. There was certainly a lot of flavor happening inside this beer. One that I had no problem enjoying. Overall: As far as saisons go, this one fit the model very well. There was a lot of funky good flavor in this saison. It felt refreshing to me and that's what really counts on a warm day. While this had a lot of good going for it, I have had some better saisons. Still, this one is worth looking up if you want to to explore the world of saisons. It's a good one to compare others to, after all, it has won some awards. I would certainly buy this beer again. Disclosure: I paid full retail price for this beer at my local liquor store as part of a build-your-own six pack. - Great Divide Heyday Belgian-style White Ale review. - Twisted Pine La Petite Saison review. - Funkwerks Tropic King Imperial Saison review.